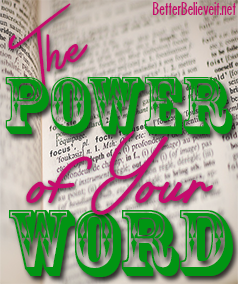 The Power of Your Word - Better Believe It! When you mention the word “power”, what pops into your mind? Usually it entails things like money or wealth, leaders in government, CEO’s, or just having control over others. But I think the most powerful person is the one who has command over language, because the effective use of words can mobilize nations, destroy millions of lives, and do everything in between. No one denies the immense power of words. Hitler used them to mobilize a nation and to kill millions of people. Martin Luther King Jr., John F. Kennedy, and countless others have used them to stir our own nation into action. In your personal life, can you remember when someone said something hurtful, and you still remember it 20 years later? Wounds caused by thoughtless words can last a lifetime. Words can build up or tear down, mobilize or paralyze, wound or heal. Words can last for millenia and affect many generations of people. In 1993, professor George Xourmouziadis found a wooden tablet with text written on it in northern Greece. It is called the Dispilio tablet, and it has been determined that it was written in the year 5260 BC, meaning those words have endured for over 7,000 years. The words you speak to others are important, to say the least. With words alone, you can bring someone close or expel them altogether. You can use them to heal, comfort, mend, and bring together, or you can use them to divide, control, conquer, or crush. Advertising is all about using words to convey, convince, and persuade. These words are so important, nearly $600 billion dollars were spent on them worldwide according to emarketer.com. All of your words are important, but the words you speak to yourself are even more important. Your words are your magic wand. They give you your power to create everything you will ever be, do, or have in your life. What you tell yourself determines the career you have, what kind of relationships you engage in, whether you are happy, peaceful, and fulfilled, and even whether you like yourself or your life. On the other hand, your words can destroy everything around you, cause you loneliness and despair, destroy your physical health, and make your life a hell on earth. 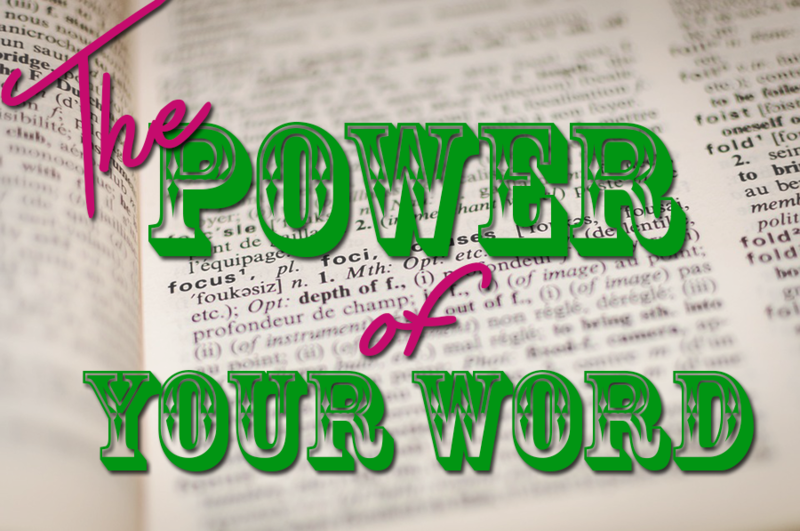 Your words are an immense force that affect every aspect of your life and your world. What you believe determines what effect words have on you. If someone walks up to you and says to you, “Yuck! You have green hair”, but you know perfectly well that your hair is blonde, his words will probably not affect you at all. Your thought would probably be something like, “What’s his problem? He must be crazy”, but then you’d forget about it and walk away. You know beyond a shadow of a doubt that you don’t have green hair. But say another person walks up to you and says, “You’re selfish and mean. You’re unlovable”. Somewhere inside, you doubt your own self worth and so this person’s words stick and affect you. Somewhere you wonder, “Is he right? Am I unlovable?” And the amazing thing about your brain is that it will always come up with answers to the questions you ask. So your brain starts looking through many years worth of data and starts to find incidences and experiences to support the idea that you are, indeed, selfish, mean, and unlovable. Words alone do not necessarily help or harm, but words that you believe do. Time after time in medical cases, a physiciam will say,something like “You have 6 months to live”, and the patient believes him or her. Then, like clockwork, they die exactly 6 months later. Did the doctor have clairvoyant powers, or did the words mixed with the patient’s belief bring about his death at that time? There are many people who feel it’s the latter. Children are especially vulnerable to the words and opinions of others. Tell a child, “You can’t sing” or “You’re ugly”, and more than likely, he will grow up thinking those things about himself or herself regardless of any proof to the contrary. Oftentimes, those ideas stay with them throughout their adult life, as well. Children are more likely to absorb and adopt other people’s beliefs and opinions, so be careful of the words you speak to the children in your life. 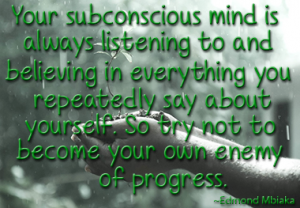 The words you tell yourself (and believe are true) are not just idle words. If I tell myself, “I can’t learn. I’m not smart”, then all my actions will comply with those words. If I am a child and still in school, I’ll do things and act in a certain way to show myself I’m right. Maybe I’ll get bad grades. I won’t join the debate team or robotics club. I’ll hang around with slackers. Every time I get a “C” or a “D”, I will tell myself, “See, I have proof!”. If I get an “A”, maybe I’ll say, “That was a fluke!”. The same activities will go on in adulthood. I won’t try to go to college. I’ll happily accept a job that requires little effort or knowledge, and not earn much as a result. I’ll cut myself off from trying to learn new things because I already know “That’s not who I am”. I’ll choose to hang out with people who aren’t continuously striving for more and constantly learning new things. Until one day when I make a different decision and back up that decision with proof. The proof is there for both “I am not smart” and “I am smart”. It only matters which one you focus on, tell yourself, and believe to be true. Try this exercise for a whole day. 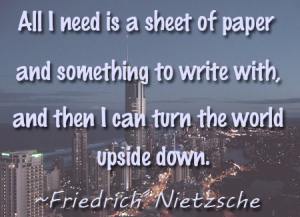 Get a notepad and try to take notes throughout the whole day about the words you use, both internally and externally. Or, if you have a digital voice recorder, turn it on periodically throughout the day so you can hear yourself. When you wake up, what are the first words you say to yourself? Jot them down. Take time every hour on the hour to take inventory and summarize the words you’ve used in the past hour to talk to yourself and to others. It doesn’t have to be in full sentences, just jot down the words you remember using. When significant events or conversations occur, remind yourself to really take notice of your choice of words. At the end of the day, review your list. Think about how those words affect yourself and others? Do they engender love, peace, understanding, forgiveness? Do they spread poison, vitriol, mistrust, anger, or discord? Did your words build up or tear down? Be sure to also notice the beliefs behind the words. If you had an argument with your significant other, and your words were like daggers, examine the beliefs you hold that made that okay. Maybe it was “If he loved me, he would have _____. Husbands should do this”. Or if you woke up and your first words were, “Ugh. I don’t want to get dressed and face Sally today”, do you believe things like, “Every day is the same old drudgery”, or do you believe, as Dale Carnegie said, “Every day is a new life to the wise man”? I like that quote because it means that you don’t have to bring yesterday’s thoughts, beliefs or experiences in to today. Today you can have a new life, be a new person, and experience things in a whole new way. To be powerful, take time to gain command over your language and your word. It’s the most important thing you can do for yourself.